Being fifty-something, I love discovering a foraging opportunity close to home. And so it came to pass that I hurried along to the local church jumble sale, just a few doors down from my own, arriving expectantly at the advertised start time. Alas, the early bird had beaten me to the worm. There were sold stickers plastered on all the best bargains … an antique dark wood hall stand ($65), a vintage wooden dresser with barley twist detail down the front (also $65) and some gorgeous depression glassware that I didn’t have the heart to price-check. I figured it was still worth a poke around. 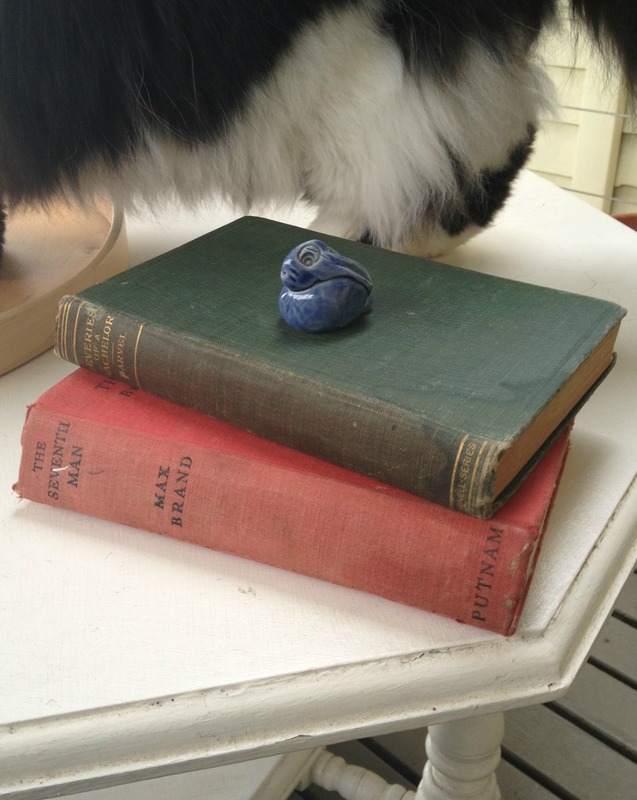 I managed to snaffle up a few little goodies … a couple of vintage books and a tiny blue Aussie pottery rabbit. And the millisecond I noticed this, an idea began hatching in a crafty corner of my brain. I asked the stallholder for a price and waited. And waited. And waited. He carefully turned my latest find over, ran his finger along the edge and held it up to eye height as if to check it was even and square. He pondered silently, wrestling with some inner dilemma. Finally, he turned to me, looked me dead in the eye and said “one dollar”. “Sure,” I smiled (with relief), pressing a gold coin into his palm and dismissing his offer of a plastic bag with a single wave. Once home, I double-checked to see what I had. 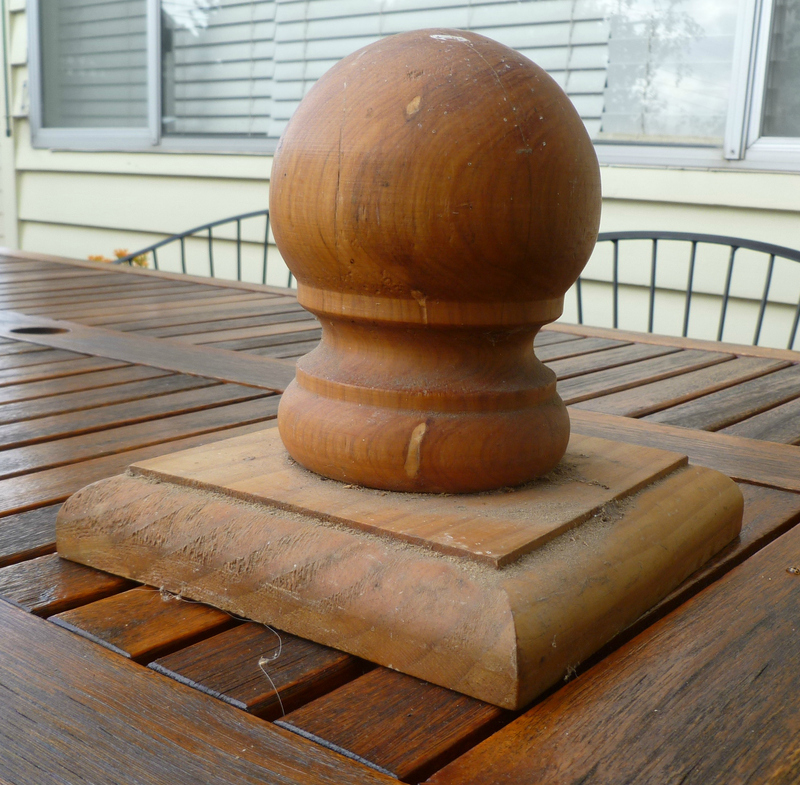 Obviously, it’s a wooden fence finial, a post topper. Right? Nothing more. Nothing less. I’ve seen plenty of these. We live on a busy street in an older part of town where there are a lot of period homes and fancy wooden fences. Our street is a main route out of the city for many late-night and on-foot revellers. Fairly regularly, on a Saturday or Sunday morning-after-the-night-before, I’ll find a finial or two and maybe a clutch of fence pickets in our front yard, assuming the merry passers-by have grabbed them from a nearby property before throwing them over our fence. I know how hard it is to get matching fence parts so I always take a wander back up the street, towards the city, find the fence where each piece/s belong and return them. It’s quite satisfying. But I had something different in mind for this finial find from the local church jumble sale. 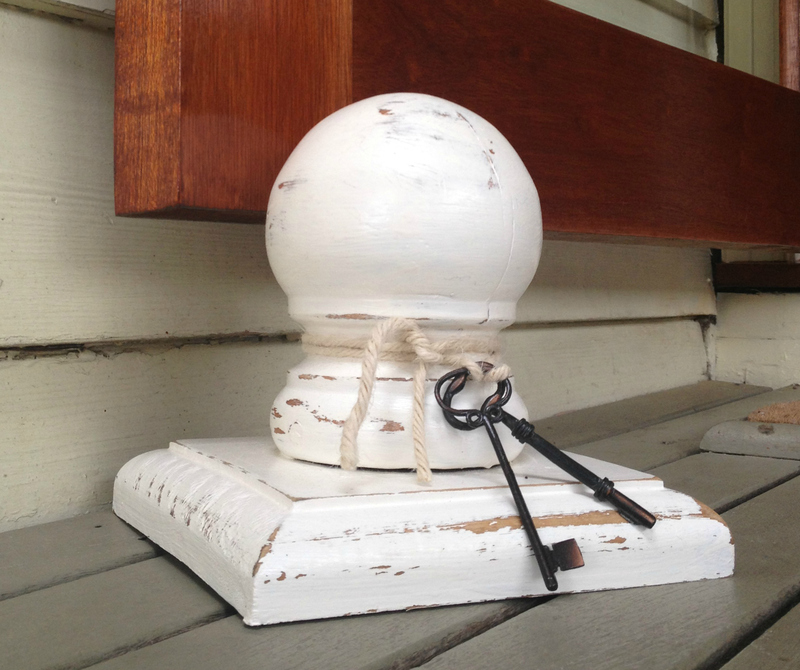 A couple of coats of paint, a layer of wax, a pair of old keys and some twine, and it’s become my new door stopper, referred to by others in this household as: “The Big Knob”. 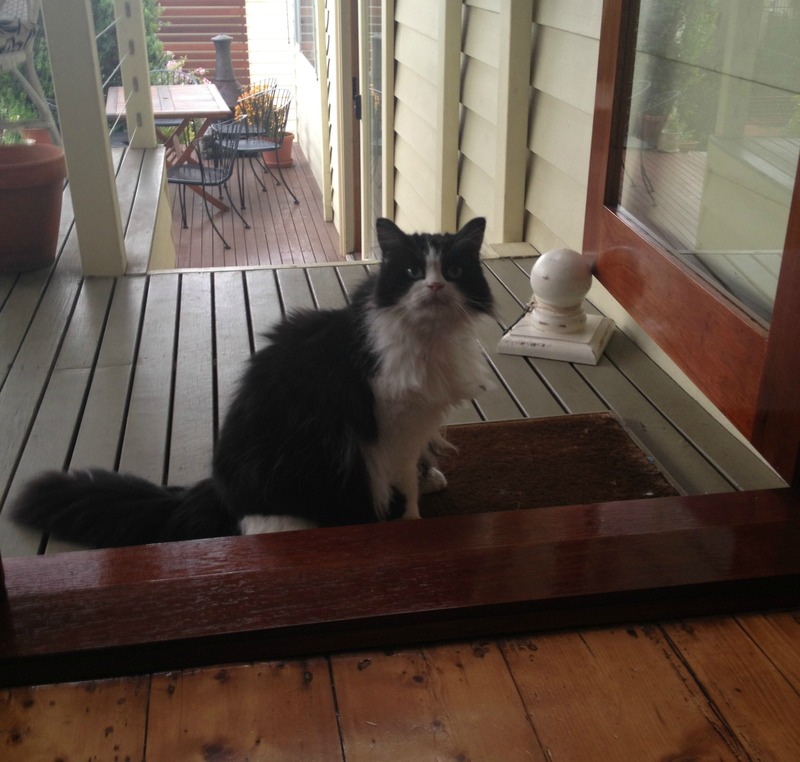 Jack Sparrow (Pirate Cat) is still a little wary of it. And I have no idea what was going through that stallholder’s mind when he was pricing this for me. I think he was probably taking a lend of me. And I fell for it … bizarre, over-dramatic hob-knobbery in the church hall. 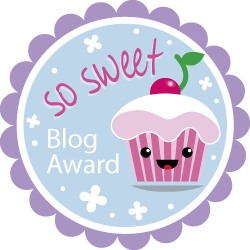 Previous Post Stick-ability or tick-ability? That was a great find and a great idea! (I’m not a crafty person so admire those who are) Every spring and fall our entire neighborhood has a garage sale (Like a jumble sale on a massive scale). People start turning up at dawn! So it is hard to get the best deals. But, like you, if one keeps looking, gems turn up in the most surprising places. I like the repurposed knob as a door stopper. The vintage books would be great as a decorative item too.